Since the third edition of this standard work in 1999, there has been a significant increase in the amount of chocolate manufactured worldwide. The fourth edition of Industrial Chocolate Manufacture and Use provides up-to-date coverage of all major aspects of chocolate manufacture and use, from the growing of cocoa beans to the packaging and marketing of the end product. Retaining the important and well-received key features of the previous edition, the fourth edition also contains completely new chapters covering chocolate crumb, cold forming technologies, intellectual property, and nutrition. Furthermore, taking account of significant changes and trends within the chocolate industry, much new information is incorporated, particularly within such chapters as those covering the chemistry of flavour development, chocolate flow properties, chocolate packaging, and chocolate marketing. 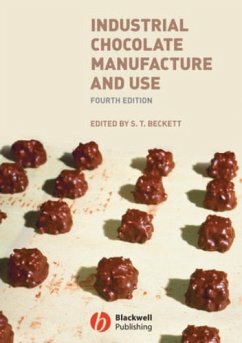 This fully revised and expanded new edition is an essential purchase for all those involved in the manufacture and use of chocolate. Karen Halttunen is Professor of History and AmericanStudies and Ethnicity at the University of Southern California, andformer president of the American Studies Association. She is theauthor of Confidence Men and Painted Women: A Study ofMiddle-Class Culture in America, 1830-1870 (1986) andMurder Most Foul: The Killer and the American GothicImagination (2000). "The contributors to this indispensable volume have applied toscholarship in American cultural history the same keen imaginationand appreciation for complexity that has made the field so excitingin recent years." "This important collection of original essays provides a mostuseful and accessible survey of a new approach to United Stateshistory. It is not just a companion but a text in its own right, anew survey of the American past from many culturalperspectives." "This well-wrought collection is a must-read. Its essays do morethan any other book to clarify the multiple meanings of culturalhistory and to document the thorough penetration of culturalapproaches to all the sub-fields of American historicalscholarship." "A comprehensive and timely overview of American culturalhistory, from its first pioneering examples to its most recentlinguistic, visual, transnational, and performative turns. Studentslooking for a lucid and lively introduction to the themes, methods,and impact of the culturalist perspective on US history will findthis volume indispensable." "This collection is a marvel of intelligent synthesis andconcise interpretation. Karen Halttunen has assembled some of thebest cultural historians in the United States and they have castunprecedented light on their contentious field from a rich varietyof chronological and conceptual perspectives. The result is anindispensable scholarly resource."